The Pirate Bay, arguably the most well-known website for accessing pirated content, has been taken offline following a raid in Sweden. Swedish police seized servers in Stockholm after a complaint was filed by a group targeting internet crime. It is the first time in several years the site has been taken offline rather than simply blocked by filters. Unexpectedly, the site's co-founder Peter Sunde - who is no longer involved - called for its permanent closure. Swedish police have confirmed the raid, which took place after the complaint from the Rights Alliance. Paul Pinter from Stockholm County Police, told the BBC that an investigation that had lasted "for years" led them to the location of the servers containing material related to the The Pirate Bay. As well as servers being removed from the data centre for examination, he said several people were now being interviewed by police. However, he would not confirm or deny if anybody had been arrested. The police operation took place in an area in Nacka, south-east of Stockholm. The area's mountainous terrain is used as a natural cooling system for computer servers. "We can confirm that the police has completed a raid in the facility which where we rent space for our data centre," hosting firm Portlane, which has servers located in Nacka, told the BBC. "This raid was not for our company or any of our employees," a spokesperson said. It added: "It was partly directed at one of our customers." According to Torrent Freak, a website that reports on news about piracy and copyright law, a number of smaller torrent websites, or sites related to the activity, had also gone down. Various reports on Wednesday suggested that the site had returned with a Costa Rican web address. However, this site appeared to be a "mirror" - meaning copy - of the real site, and search functionality did not work. The Pirate Bay has operated for over 10 years, and in that time has become a focus for the creative industry's war on copyright infringement. It is one of the internet's most-visited websites, and the movie, music and software industries blame it for losses running into billions of pounds. Despite The Pirate Bay's operators being convicted of copyright violations, authorities have struggled to stop the site from operating. In the UK, internet service providers (ISPs) were ordered by the High Court to block access to the site in 2012. Other countries rolled out similar measures. The effectiveness of such blocks has been disputed. Sites will evade them by changing domains, or users will utilise proxies to circumvent them. The Swedish raid steps up the effort to stop people reaching The Pirate Bay by knocking the site itself offline, although for how long is unclear. Prof Alan Woodward, a security expert who has been working with European authorities to shut down illegal sites, said: "There have been raids before from which Pirate Bay has recovered. "Recently they have taken steps moving their infrastructure to be more distributed as a way of being more resistant to raids, so I would imagine they will reappear in some form." In 2012, The Pirate Bay announced it was to move its site to the cloud - internet-based storage, which can be shared across a variety of locations - so that raids would apparently be ineffective. At the time, the site said: "The site that you're at will still be here, for as long as we want it to. Only in a higher form of being. A reality to us. A ghost to those who wish to harm us." That confidence in the site's agility appeared misguided as it remained unreachable well into Wednesday. But according to Peter Sunde, it will be indifference that closes the site, rather than police action. 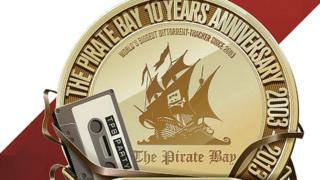 "News just reached me that The Pirate Bay has been raided, again," he wrote in a blog post. "That happened over eight years ago last time. That time, a lot of people went out to protest and rally in the streets. Today few seem to care. And I'm one of them. "Why, you might ask? Well. For multiple reasons. But most of all, I've not been a fan of what TPB has become." He bemoaned the level of advertising found on the site and criticised what he called a lack of "soul" in the community.